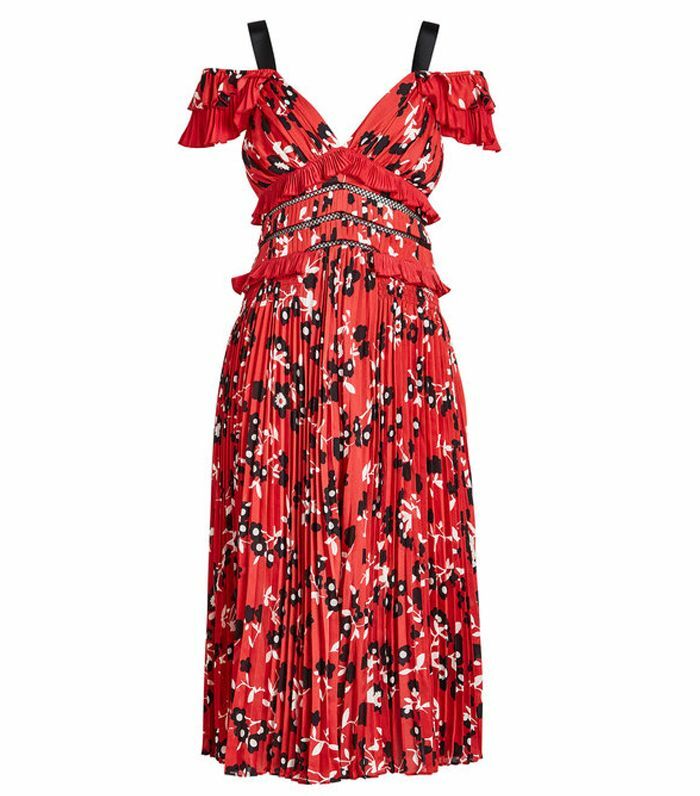 This weekend, at every turn, I saw another floral midi dress, and it seems like Meghan Markle's approach to summer city dressing is no different. At an event for the Invictus Games in London on Saturday, Markle wore a floral green pleated midi dress by the go-to label for luxury dresses at a sharp price point: Self-Portrait. This brand is known for its now signature sculpted lace dresses, but this season, it moved its aesthetic forward by reworking the classic tea dress. Markle proved once again that she is going to have a more modern approach to traditional royal dressing, as although the dress has a conservative knee length, it features a fashion-forward off-the-shoulder neckline. Green floral-print midis have been the surprise hit of the season, as dresses from ASOS, Kitri and more in this style can't be restocked fast enough. When it comes to smart dresses, it can be difficult to find a coat or jacket that doesn't look awkward sat with the dress. However, Markle masterfully paired her midi with a classic black Alexander McQueen blazer. This worked perfectly because it pulled out the black, which was in the floral print. In the search for something to go over your dresses for wedding season, Markle shows that you can't go wrong with a classic black tuxedo. Keep scrolling to see—and shop—her latest look. Anyone else considering buying one of these for wedding season?